Artwords is open as normal over the Easter weekend 19-22 April 2019, please see our regular hours listed below. The landing pages show a selection of our newest book arrivals - click on the image and details of the publication are shown on the left hand page, click on the title or 'more information' for more detail on the item. Our stock is updated every week. Your privacy is important to us. Artwords Bookshop takes the privacy of all its customers and users very seriously. We strive to take care with customer and user information. We are committed to protecting your privacy online. Artwords Bookshop will never share any of your personal information with third parties.We will take all reasonable steps to ensure all personal information provided by you is held securely on file in accordance with current data protection legislation. Does your publication have a UK book trade wholesaler, or book trade distributor? If so please call 020 7729 2000 to make an appointment with the buyer. We buy from a number of national and international book trade distributors and wholesalers. If your publication is not available from one of these, then we are afraid it is unlikely we will be able to stock it at our shops. 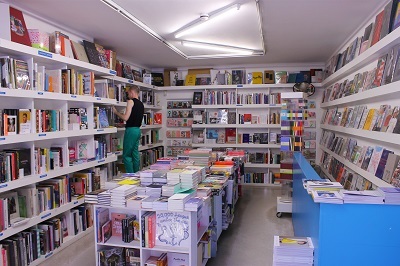 Artwords Bookshop was established in 2001, we specialise in books on the contemporary visual arts and visual culture, covering the subjects; fashion, graphic design, architecture, photography, fine art and visual & critical theory. We also stock a very wide range of magazines on these subjects. If your book is not currently stocked by Artwords, please see the section on Buying above. If you are an author whose book is currently stocked by Artwords and you would like to come in to sign copies (not for a public event), please contact ben@artwords.co.uk. For all other event-related matters, please see Author Events above. There are no current vacancies, but if you are interested in working at Artwords please leave a copy of you CV at either of our outlets; or email your CV to shop@artwords.co.uk. Your CV will be held on file for three months and you will be contacted if a position becomes available in that period.